Casa Jessica is an attractively built villa in a traditional pueblo style only a mile to the sea - with good snorkeling -and two miles to sandy beaches. Breakfast in the morning sum looking down to the Mediterranean and enjoy the sun for the rest of the day in the enclosed, graveled garden or on the dining porch. 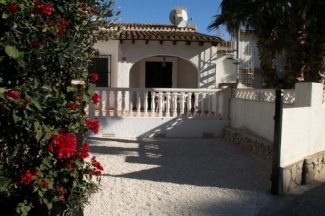 There are two bedrooms � both looking down to the sea � one with a double bed and room for a third bed, one with two singles. The comfortable sitting room with wooden beams under the lofty ceiling is comfortably furnished and also a tv and video. The well-equipped American kitchen with microwave and coffee-machine is right by the dining table and outdoor dining porch. Enjoy our BBQ. The bathroom has a full bath and shower. There is a washing machine for your use. A large swimming pool (with shallow pool for toddlers) and a tennis court are one minute stroll away and freely available. From a dining porch, you enter a spacious living room with a dining area by the window to your left (tiled dining table and comfortable dining chairs( next to the well-equipped American kitchen. This leads to the sitting area - two deep blue sofas by the open fireplace - and a tv and video. Exposed wooden beams support the high, sloping ceilings to give a wonderful sense of space. To your left is the bathroom. Behind the living space are the two bedrooms with a sea view, one with a terrace which is perfect for breakfast in the morning sun. The lockable front gates give complete safety for young children. There is no through traffic anyway on the little lanes, filled with colorful, Mediterranean blooms, that take you down the shared pool 100 meters away. Again, perfect for small children with a separate, shallow toddlers pool. A tennis court is freely available. Just bring your own rackets and balls. Our villa managers live 5 minutes' drive away and WILL SEE FAST to any problems. 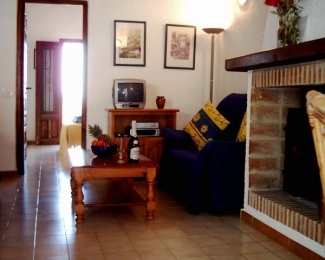 # **These rates are net rental rates in Euro and the rent is payable in advance. We will send you detailed information on arrival procedures - normally you will be met at the house by our local manager whom you should contact by phone one hour before your estimated arrival and again when you are in Moraira five minutes from Casa Jessica. We have broken down our charges for the sake of transparency so you can exactly what you are paying for. 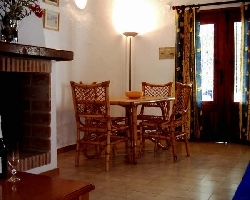 A house clean before and after your stay (65 Euros) is payable locally. You are welcome to bring your own sheets and towels. Or we can supply a laundry service at your request which costs 13 Euros per head per change of sheets and towels - also payable locally on arrival. We also ask for 3.5 Euros per day (7 Euros in winter) to cover the cost of heating, water, gas and electricity charges. Again you only pay this after your arrival.